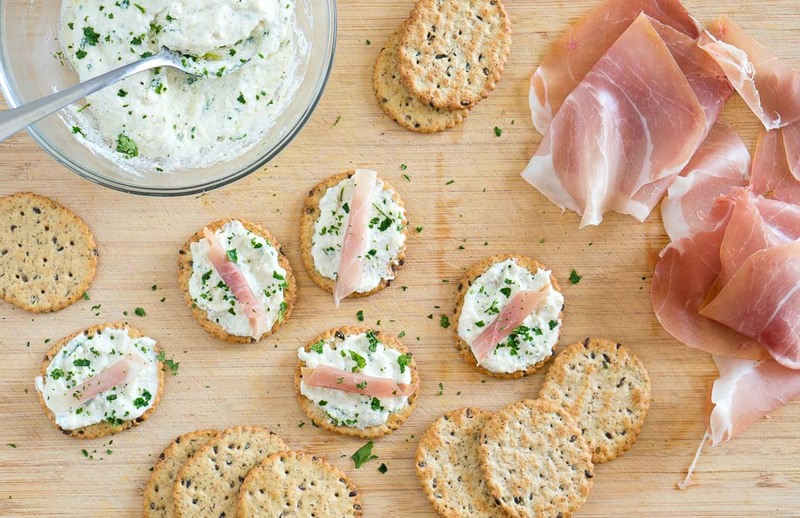 These ricotta and prosciutto cracker appetizers go wonderfully with the ricotta-garlic-herb spread, topped with prosciutto. Delicious & oh-so-flavorful! 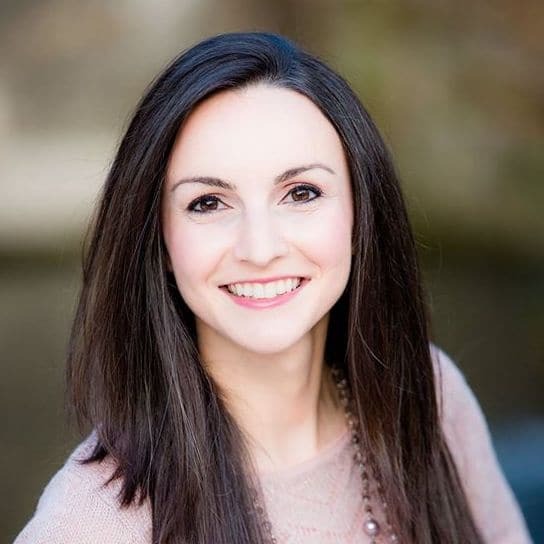 I feel like the holidays are around the corner and while we all enjoy holiday parties and time spent with family, this time of the year can become overwhelming, stressful and expensive. 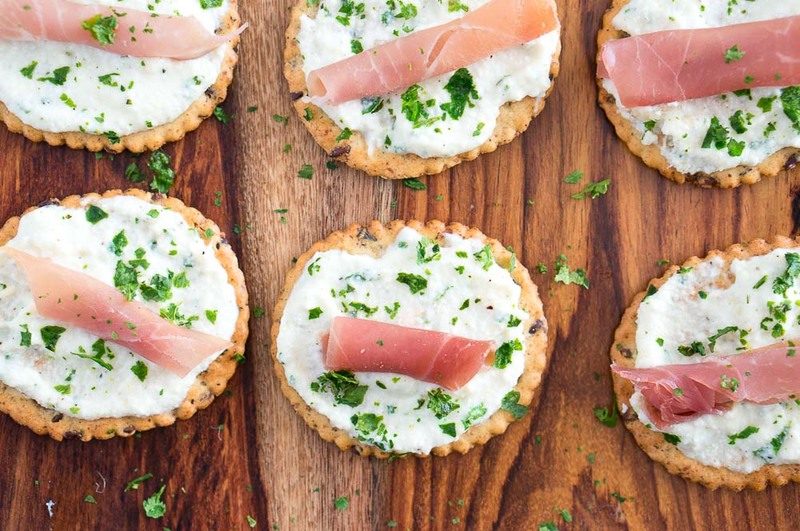 So today, I am sharing with you how to decrease your holiday party stress by making these easy delicious Ricotta and Prosciutto Cracker Appetizers. 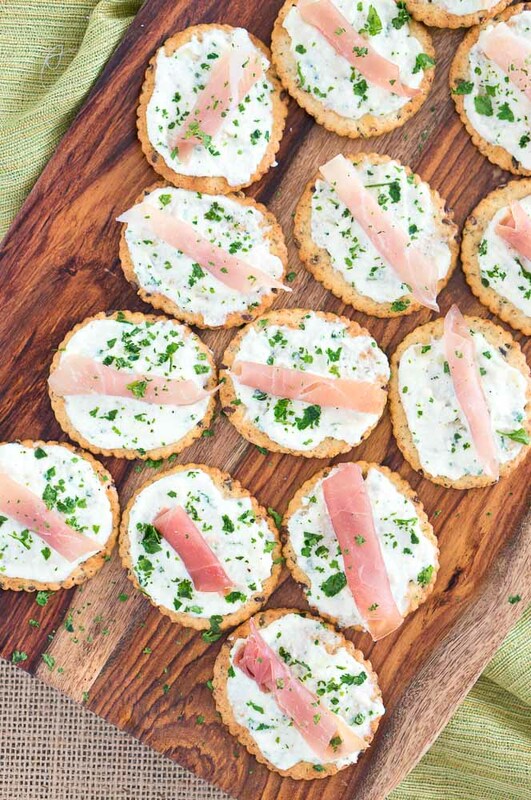 These pretty and elegant appetizers are easy to make – a no-bake recipe that takes less than 20 minutes to prepare and they are inexpensive. The appetizers are perfect not only for holidays but also for Game Day, a family get-together or a light afternoon snack during the day. These Back to Nature crackers were so addictive, it was hard to stop eating them. 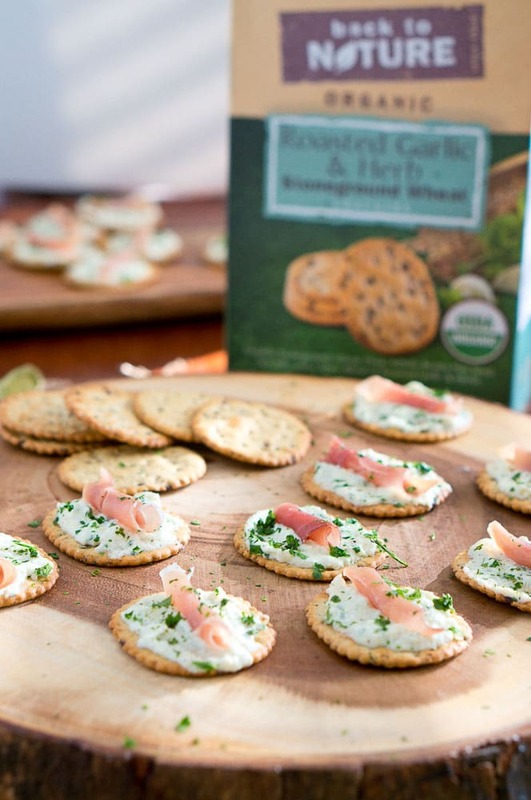 These Roasted Garlic and Herb crackers from Back to Nature go wonderfully with the ricotta-garlic-herb spread and topped with prosciutto. They are savory, delicious and oh-so-flavorful! 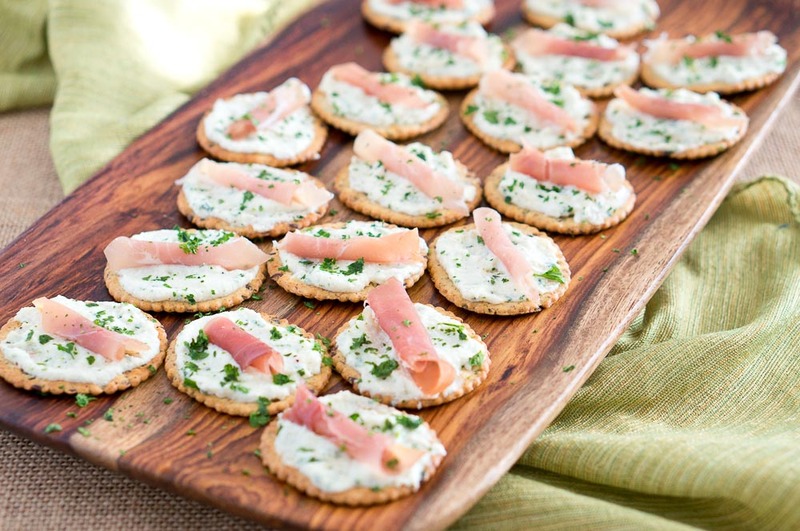 I hope you enjoy this recipe for Ricotta and Prosciutto Cracker Appetizers! I love Back to Nature’s products – they are simply delicious and simply good! 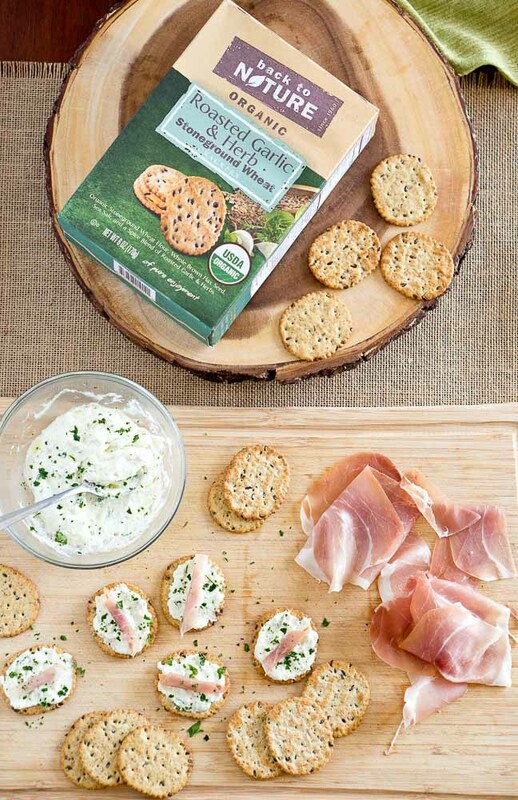 Their crackers category come in a variety of flavors: roasted garlic & herb stoneground wheat crackers, rosemary olive oil crackers, sesame seed rice thins, sundried tomato basil crispy wheat crackers, and many more. Back to Nature offers a wide range of product categories, including crackers, cookies, crackers, trail mixes and nuts, granola, cereals, juices, and soups that are delicious and affordable. I feel confident using Back to Nature products in my kitchen because they offer not only great-tasting products that are flavorful and delicious but also they are Non-GMO products produced in compliance with the Non-GMO Project Standard. Since the brand began the Non-GMO Verification process back in January 2015, they have obtained verification on more than 70 Back to Nature products. Back to Nature understands it is important for their consumers to know how their food is sourced and the brand wants them to feel confident about the ingredients in their products, which is why Back to Nature is committed to transparent ingredient sourcing and is working towards obtaining Non-GMO Project Verification for all of their products by the end of 2016. What is the Non-GMO Verified Seal? The Non-GMO Project is an independent non-profit organization that offers Non-GMO verification and labeling recommendations. It is the only organization that provides independent verification for GMO products in the US and Canada. To celebrate this key milestone and October being Non-GMO Month, Back to Nature is offering fans the chance to win a “Nature-cation” trip. Visit and like Back to Nature’s Facebook page and describe your favorite place to connect with nature. One lucky grand prize winner will win a “Nature-Cation” trip for their family and five additional winners will receive a Non-GMO prize pack. Visit Back to Nature’s Non-GMO Month Sweepstakes for more information. For more information about Back to Nature’s Non-GMO Month Sweepstakes, go HERE. Disclosure: This post is sponsored by Back to Nature in conjunction with Blog Meets Brand and I have been compensated for my participation. All opinions are my own. 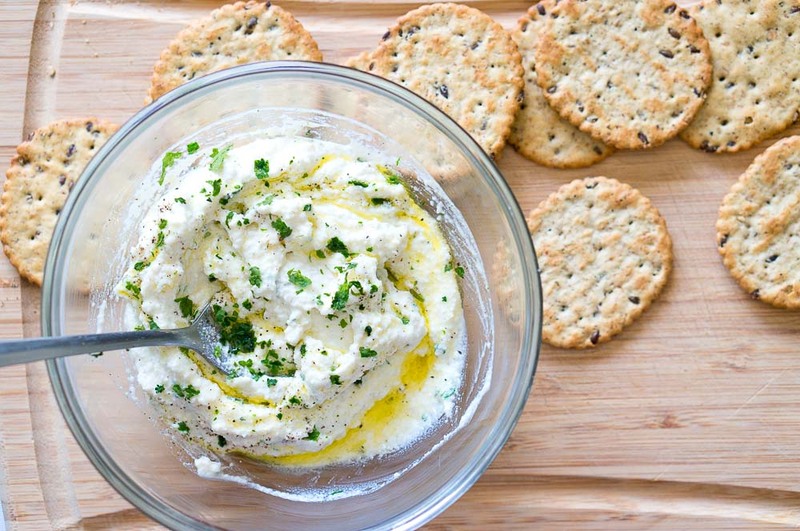 In a small bowl, mix ricotta, garlic, olive oil, finely chopped parsley, salt and pepper together. Set aside. Cut prosciutto into small triangles. Using an off-set spatula, smear just enough of the ricotta mixture onto each cracker, until each cracker is thinly covered. I love easy AND tasty. 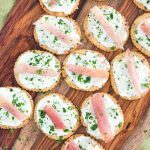 These appetizers are perfect for a hungry bunch and they do look like they are super easy to make. I’m always on the search for something we can whip up in no time. There are perfect!! 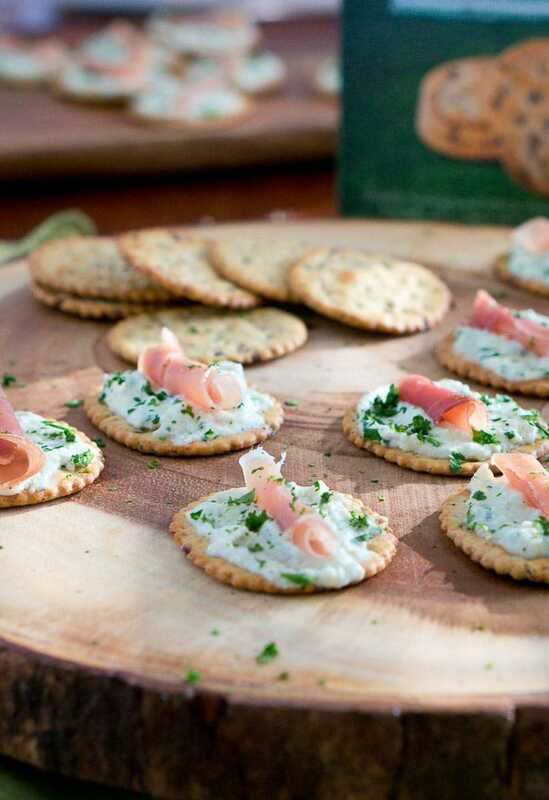 Great holiday appetizer and so fast and easy to make. I love the ricotta with them.